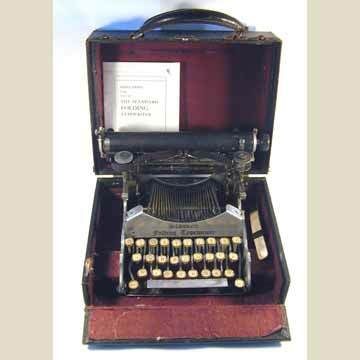 The Standard Folding appeared on the market in 1907 as the first truly light weight portable typewriter. It was made of aluminium and the carriage folded forward and rested on the keyboard when stored. The Standard Folding was a revolutionary design by inventor Frank Rose that was to survive for decades. In 1912 the direct descendant of the Standard appeared as the Folding Corona, a machine that stayed on the market until 1940. Two models of this first Standard Folding appeared. The one depicted here is the first model, with a shift key on either side of the keyboard. The later model had both shift keys on the left side of the keyboard. A total of roughly 12,000 Standard Foldings were built. When the re-designed folding appeared as the Corona, the range of serial numbers continued where the Standard Folding had stopped. See the book TYPEWRITER, page 198 for more details.